Suffice it to say, Alexandria was a thriving city by 1st century BC, known for the grand Temple of Serapis that was adjoined to the Great Library of Alexandria. And while the city aptly secured its cultural status as a great center of learning, it also flaunted its commercial glory with the Pharos Lighthouse – constructed on an island by the polis, and considered as one of the ancient Seven Wonders of the World. And the good news for us history enthusiasts is – most of these fascinating architectural high-points are presented through a superb 3D animation concocted by the folks over at AncientVine. As the video makes it clear at the beginning, the recreation pertains to the setting of this Egyptian metropolis circa 51 BC. It should be noted that after the fall of Carthage (in 146 BC), Alexandria was also dominated by the Roman sphere of influence – so much so that by 80 BC, many parts of the city possibly passed under nominal Roman leverage. In any case, circa 51 BC, the Ptolemies (Cleopatra’s dynasty) still had control of Egypt, which paved the way for their bitter embroilment in two successive Roman civil wars. And by 30 BC, their entire Egyptian realm was formally annexed by Rome, and Alexandria was declared as a province of the newly formed Roman Empire under the directive of Augustus. The city however continued to thrive as the second largest metropolis of the empire, and evolved as one of the classical centers of learning of Greek disciplines, like philosophy and mathematics, till 4th century AD. One of the largest libraries of the ancient times, the Great Library of Alexandria was dedicated to Muses, the nine goddesses of art. And in spite of its eminence, the grand library’s founding is still lost in legend – with most scholars agreeing that the impressive institution was initially established by Ptolemy I (305-285 BC), but was fully completed during Ptolemy II’s reign (285-246 BC). It was the latter ruler who took the brilliant (yet surprising) initiative of sending invitations to other kings to contribute their books and tomes to the library. On many levels, the search for books almost took the obsessive route – with even commercial ships being thoroughly inspected by the authorities for papyrus rolls (that were either confiscated or returned after copies were made). On other occasions, the royal members of Egypt sponsored special trips to well known book-fairs (like in Athens and Rhodes) for acquiring various rare specimens of literary works. One significant (though arguable) incident mentioned by Galens, refers to how Ptolemy III paid fifteen talents (1,000 lbs/450 kg) of a precious metal to the Athenians for procuring the original scripts of Aeschylus, Sophocles and Euripides. 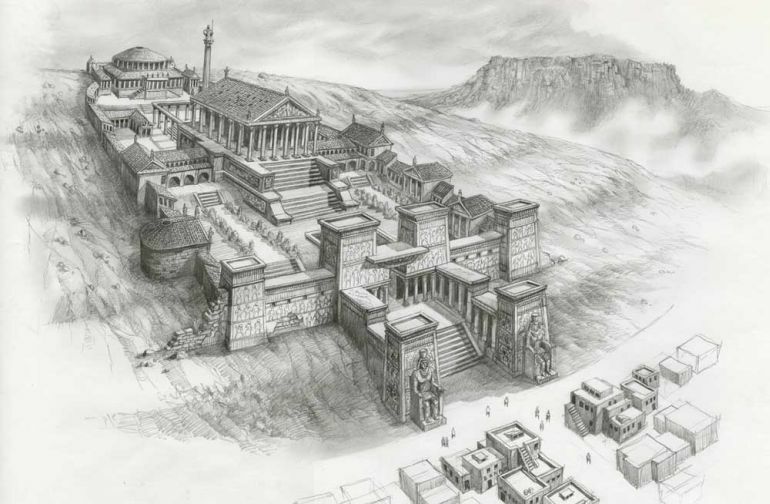 In any case, there is no doubt that the Great Library of Alexandria was a massive structure, with various estimates pointing out that it could hold over half-a-million books. It is also said that Marcus Antonius gifted Cleopatra over 200,000 books for the Royal Library – though this figure might just be a bit fanciful. As for the architectural scope of the library structure, it was possibly joined with the so-called Serapion, the magnificent Temple of Serapis. Showcasing a brilliant ‘fusion’ of both Egyptian and Greek architectural elements, the ‘collective’ campus boasted various spatial features, including specific rooms for reading and dining, lecture halls, gardens, colonnaded walkways, and of course the great hall with its array of organized bookshelves. It should also be noted that the library was probably a part of a bigger complex that belonged to the umbrella institution of the Musaeum of Alexandria (or Institution of the Muses). This Musaeum was the focal point for learning of various disciplines, like the philosophical schools (such as a Platonic Academy), music and poetry schools, and the library with its storehouse for a multitude of tomes. The Arab descriptions of the lighthouse are remarkably consistent, although it was repaired several times especially after earthquake damage. The height they give varies only fifteen per cent from c 103 to 118 m [338 to 387 ft], on a base c. 30 by 30 m [98 by 98 ft] square…the Arab authors indicate a tower with three tapering tiers, which they describe as square, octagonal and circular, with a substantial ramp. 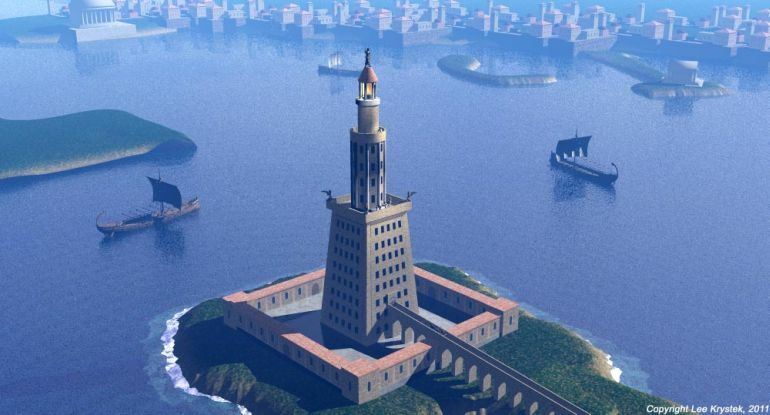 Now in terms of design, the Lighthouse of Alexandria built from light-hued stone blocks, was vertically divided into three components – the lowermost (and broadest) square section with four huge facades, the thinner middle section with octagonal plan, and the upper-most slimmest section with a circular plan. The functionality of the enormous structure was related to this upper level, with a mirror being installed atop it that reflected sunlight during daytime, while fire was lit during night. And given the sheer volume of the facades, the arranged stone-blocks of the ancient lighthouse were supposedly reinforced with molten lead so as to withstand the force from the incoming sea waves. 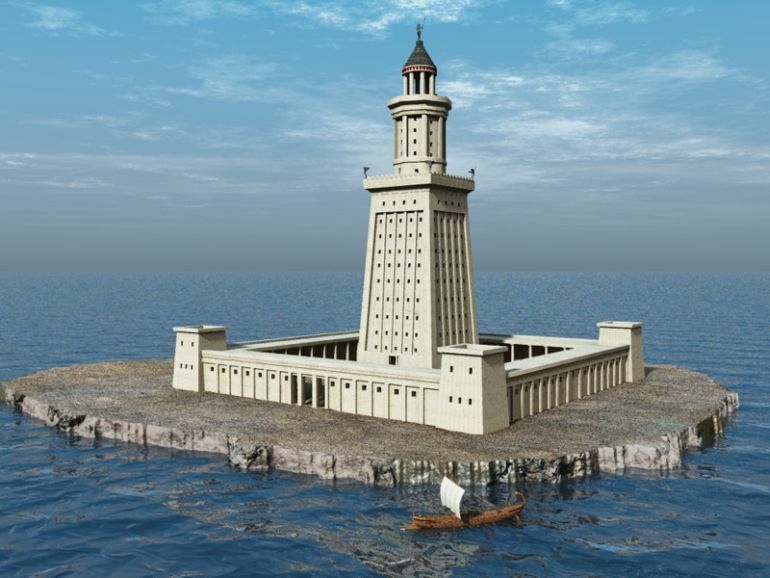 Given such advanced engineering credentials, it comes as no surprise that the Lighthouse of Alexandria was considered among one of the Seven Wonders of the Ancient World.